Lingua Cultura is an international journal, published in February, May, August and November. 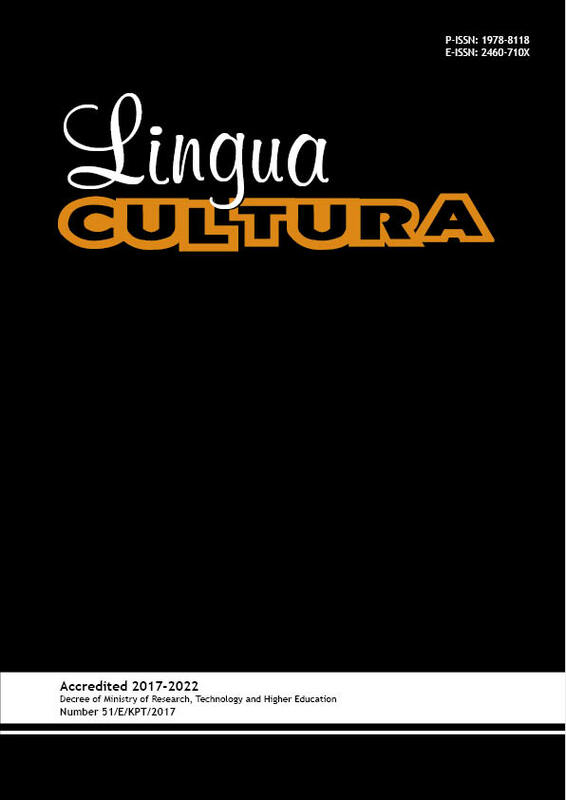 Lingua Cultura focuses on various issues spanning in the study of language, culture, and literature. The coverage of language includes linguistics and language teaching, the area of culture includes cultural studies and social studies, and the coverage of literature covers the analysis of novel, film, poem, and drama using the relevant theories and concepts. Lingua Cultura has been accredited by DIKTI under the decree number 51/E/KPT/2017 and indexed in Crossref, Microsoft Academic Search, Google Scholar, Indonesian Publication Index (IPI), the World Catalogue (WorldCat), Bielefeld Academic Search Engine (BASE), Directory of Open Access Journals (DOAJ), Science and Technology Index (SINTA), Academic Resource Index (ResearchBib), Scientific Indexing Services (SIS), and Indonesian Research Repository (Neliti).